Self-propelled harvester for green onions. 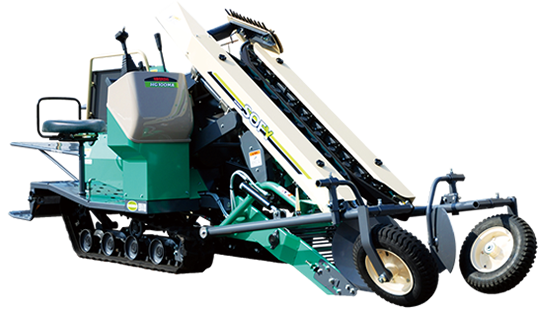 The Sofy HG100 is a green-onion harvester that can operate the following steps in a single operation: digging green onions, removing dirt, and harvesting. It can harvest and dig up green onions from any stitches in the field. The Sofy HG100 is compact-sized and, capable of tight 180°turns which makes it easier to harvest even in small fields. Transforming the back-straining conventional method of green onion harvesting, Sofy HG100 is a revolutionary machine that can be opreated from a comfortable position. Further, it offers the advantage of increased speed, reducing to one-third the hours of work in comparison with the conventional harvesting method. Copyright(c) 2017. KOBASHI INDUSTRIES CO.,LTD. All Rights Reserved.